Do you know what the exact SEO factors used by Google to decide rankings are? It’s a mystery which I don’t think will ever be revealed to the general public. Google uses hundreds of ranking factors to decide the ranking which keeps changing over time. And with the introduction to RankBrain, it’s all automated and decided by machines. While we can’t remember all the ranking factors to determine how hard it’ll be to outrank a website, there are few general metrics we use regularly. These metrics (although not 100% correct), give us a good idea of the competition and authority. One such metric is Domain Authority (abbreviated as DA) introduced by Moz as an effort to predict how well a domain will perform on SERPs. I often come across questions and doubts regarding DA when browsing forums, Quora, and other communities. So, in this article, I’m trying my best to explain what is Domain Authority, Page Authority, MozRank, and the best tools to check domain authority in 2018. Grab your reading glasses, a cup of coffee, and enjoy this informative article. DA is a metric developed by the famous SaaS company Moz, as an effort to predict the quality of domain and how it will rank on search engines. It assigns a search engine ranking score called DA score to each domain which ranges from 1 to 100. A domain with DA close to 1 is supposed to be weak while a domain with DA close 100 is super strong. As you may have guessed, a brand new domain will start with DA 1 and eventually grow. DA of linking domains, etc. Note that DA is not an official metric by Google but with years of Google algorithm updates, it has stood true in many cases. Hence, if you have a better DA than your competitors, expect to have better rankings. Referred to as PA, Page Authority works similarly to DA but for individual pages. DA for a website will be same for all pages, whereas PA will defer. Similarly, PA for other pages will defer, but the overall DA of the domain is constant, i.e., 27. When using these tool to calculate DA and PA score, you’ll also see an additional score called MozRank. MozRank is a metric to calculate the strength of external links pointing to the page. Quality of the linking domain is of more importance here than quantity. It ranges on a scale of 0-10 (10 being the highest), and the average MozRank for a domain is 3. Now the next is, how to calculate Domain Authority? 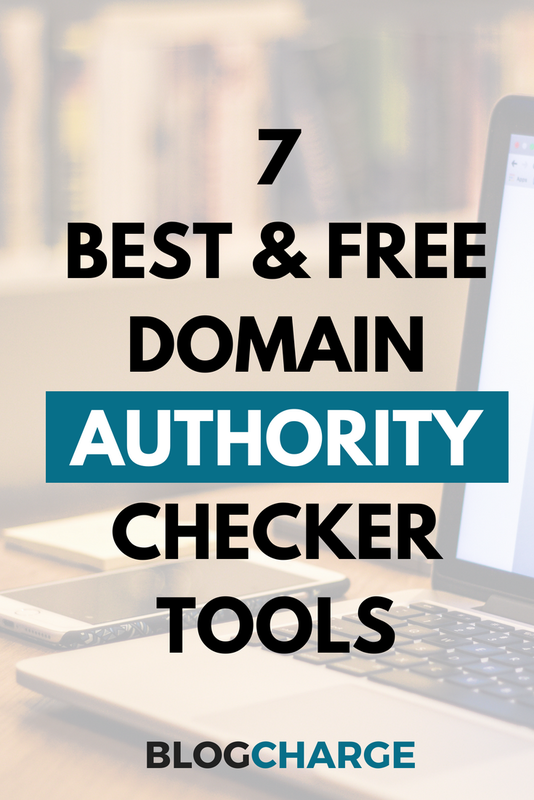 For this, I have listed the top 7 free domain authority checker tools. Note that all of these DA checkers make use of Moz API to calculate DA and PA. If you see different DA score on various tools, recheck it on the official tool. Earlier it used to be Moz’s Open Site Explorer (OSE) tool to check the DA and PA score. But MOZ stopped updating its index and launched a new, improved version called Link Explorer. As per Rand Fishkin, the new tool is more accurate, updated daily, and uses a bigger index to calculate the scores. Link Explorer is the best and an only ad-free tool to check domain authority. And since it’s official, you don’t have to worry about if the score is legit. The above data is more than enough to analyze a domain and see how authoritative it is as a competitor. You can also download the results to share with your clients. The tool is still in beta, and there are good chances that it’ll be a premium tool available to pro users once publicly launched. Also, there’s a limit of 10 queries a month available for free users. You can bypass this limit by using MozBar – a free Chrome extension to check DA scores on the go. The one major downside of Link Explorer is that you can check only one domain at a time. If you want to bulk check domain authority, Small SEO tool’s DA checker is a good one. You can download the result as an excel report for handy access. As you can see in the screenshot, sometimes the tool fails to show any score which can be annoying. Also, there are too many ads on the page to destroy your user experience. The next free DA checker is developed by SEO Review Tool. It’s a basic tool which checks for only one domain at a time. Robin Gupta’s DA Checker is another easy to use and simple DA checker tool. It allows you to check DA for up to 50 domains at one go. Along with DA and PA, you can check Moz Rank, IP Address, and download the result. There are no annoying banner ads, but there are links to buy SEO services and products. Also, the bulk checker works perfectly and gives correct scores. I’ll prefer to use this tool if I want to bulk DA check. If you’re a professional in this field and want to bulk check more than 50 domain at once, this tool has got your back. 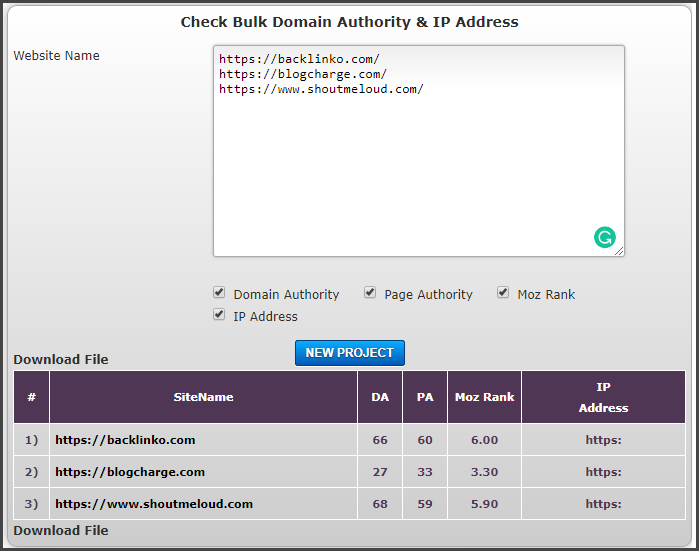 Bulk Domain Authority checker allows you to add up to 100 domains and check the scores in a few seconds. There are no annoying captcha or subscription required. Additionally, you can download the result as an excel spreadsheet. There are a few Google banner ads which aren’t annoying and can be ignored. If you’ve been learning SEO or looking for SEO-related tools online, you must have heard the name “The HOTH” – a popular SEO service provider reseller. Along with SEO services, they have created some useful free tools to help – one of which is Bulk MOZ DA checker. The tools are limited to only 25 URL’s per check and require you to add email and complete Google captcha before showing the result. Although there are no visible ads and smooth user experience, asking for email isn’t necessary. Also, submitting my email added me to their Training + Bonus list which I never asked. Unless you’re a big fan of The HOTH or existing subscriber, I don’t recommend using this tool for checking DA. The last tool in our list of best Domain Authority checker goes by the name Bulk DA Checker – a tool built specifically for this purpose. It’s a straightforward tool which can check up to 10 domains at once with the ability to extract as an excel sheet. There are few Google banner ads on the page, but the overall user experience is excellent. The speed is also good, and there’s no need to complete captcha or add email when checking repeatedly. Competitor analysis is still one of the recommended methods of keyword research. By calculating how strong or weak your competitors are, it becomes easier to plan your content, website, marketing strategy, and other things. Domain Authority, although not the most important, is a good metric to get a clear picture of the competition. And these Domain Authority checker tools are more than necessary to perform the competitor analysis. What’s the one metric you find most important when doing competitor analysis? Is it DA or anything else? We would love to get some personal opinions. If you enjoyed reading this post, make sure to share it and leave a comment below. Also, if you know a better tool which should have been on the list but isn’t, suggest me. I have created a domain authority checker where users can check up to 500 URLs at a time. Can you add it to your list? All These Tools Are Really Helpful For Blogger`s To Check Their Website Performance To Every Engle. Thanks For Sharing Such These Tools Are Great.